Transfer from airport to hotel in Cusco. Plane ticket from Lima Cusco Lima. City tour to the "City of Kings." 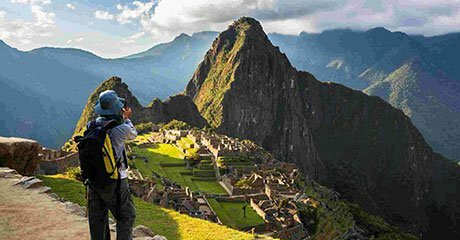 Revenues for all attractions to visit Inca Trail, Machu Picchu, Sacred Valley, City and surrounding areas, churches and museums. 3 nights in hotel (subject to availability). Tickets to Machupicchu train back to Ollantaytambo and bus to Cusco. Fares Drop Machupicchu - Aguas Calientes. The Koricancha: Palace and Convent of Santo Domingo Religious center known as "The Temple of the Sun" where you will admire the impressive engineering used in its construction. Qenqo Ceremonial and ritual center, amphitheatre where sacrifices were made. Puca-Pucara An old tambo (resting place), monitoring place throughout the Inka Empire Routes. Tambomachay At 7 Km. From the city of Cusco, ceremonial center of cult to the water , known traditionally as the place where water rests excursion time: around 5 hours. Inca Trail Start Meet at the office at 05:45 hrs to board the bus. Ensure you have your original passport and student visa card (if applicable). The journey to trailhead at km 82 takes approximately 3 hours. We will enjoy breakfast along the way. Walking times are always approximate depending on weather conditions, group ability and many other factors, but you will walk about 2-3 hours before lunch. After lunch, we walk on just past the village of Huayllabamba to our first camp (3000 mtrs). This first day we're going to walk through the valley (2380 masl) small climb to a platform overlooking the Incan Llactapata village where you can have a superb views of Veronica mountain. Inca Trail Day 2 is the most difficult day (Dead Woman's Pass) walking is located about 3000 mtrs to 4200 mosl the highest pass of this trek . You can walk at your own pace, stop to get your breath whenever you like. You'll find your energy returns once you continue down to the valley of Pacaymayo. Campsite at 3600 mtrs. You can hire a porter from the village of Wayllabamba to carry your pack to the top of the pass for approximately US$120.00. You must organize and pay this money directly to the person who carries your items. Please check your belongings upon receiving them at the end of this service. Get up extremely early to arrive at Intipunku, "The Gate of the Sun," and view the first sun illuminating majestic Machupicchu. It is still a 20 min walk down from here to the famous view from the terraces at the end of the trail. Take your photos now before the 10:30 hrs crowds arrive. Your tour of Machupicchu should finish between 10:30 hrs and 11:00 hrs and you have free time to climb Huayna Picchu (it will take at least 90 minutes). A maximum of 400 hikers can climb this mountain per day, so start immediately after your tour! Or just collapse under a tree and quietly reflect in amazement at the mystery, the architectural achievement and beauty of Machupicchu. FAREWELL We'll be at your hotel at least two hours before your flight leaves to take you to the airport Where you should check your plane ticket and pay the airport tax, we'll be with up to you get on aboard.